so we wanted to share it with you here. 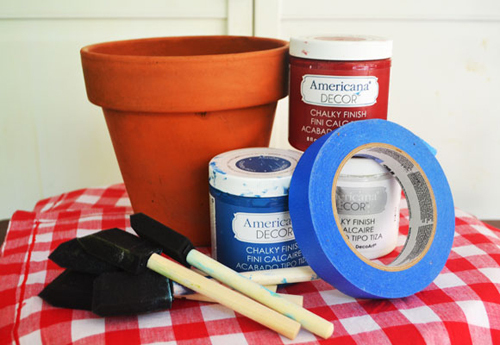 It's an easy and fun crafty idea using terra cotta clay flower pots, paint and some decorations. 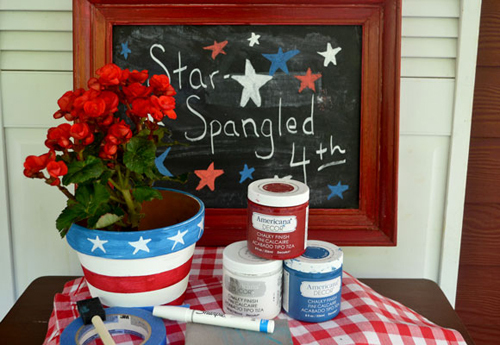 It�s easy to add patriotic style to your patio this July 4 with terra cotta pots and chalky finish paint. These starred-and-striped pots can hold bright summer geraniums, flickering votives, bundles of silverware, or showcase a s�mores bar. Cover the pot with white paint, using the foam brush. Let dry, about an hour, or longer. Tape off the stripes using the painter�s tape. It�s easiest to start just under the rim for the first stripe. Using the width of the painter�s tape as a guide (.94-inch works well), tape off the next stripe, being sure to press the tape against the pot. Paint the red stripes, let dry. Peel off tape. Paint the blue stripe on the rim, let dry. Sanding the edges of the pot with a sanding sponge adds a rustic look. Use the white paint marker to draw stars on the rim, and also to clean up any splotches on the stripes. Optional, but nice: spray the completed terra cotta pot with acrylic spray to seal. 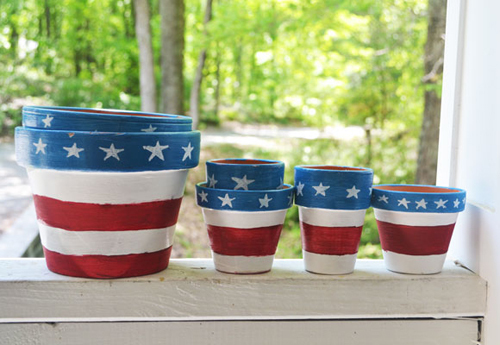 When your patriotic pots are completed, they can be used to display flowers. Geraniums and petunias are pretty and perfect for July 4 parties. [Read More] Make this Garden Planter, It's Easy! [Read More] Grow a watermelon in a pot.